If you have used Legacy Family Tree to create your genealogy website, it's now easier for others to find you with the new GenDexNetwork.org announcement below. But first, creating a website in Legacy is easy. Go to Internet > Create Web Pages, select your options, and click the Create Web Pages button. Since the website is created/saved on your computer, you can preview it before you ever upload it to your web space (which you are likely already paying for, just ask your Internet Service Provider for details on uploading your files to your web space). Notice on the Other tab, there is an option to create a "GENDEX genealogical index." With this selected, Legacy will create a special file that you can share with GenDexNetwork.org, and thus make it easier for others to find you and your ancestors. GenDexNetwork.org is a completely free genealogical index (GenDex) which indexes family trees on the internet. The first GenDex was operated by Gene W. Stark from 1994 until 2004. It was begun when computer indexing for genealogical information was in its infancy. Since its inception on April 4th, GenDexNetwork has already indexed over 9,250,000 records. GenDexNetwork.org is fully compatible with Legacy Family Tree's gendex output. It is specifically for genealogists who want to publish their family trees by themselves and who don't wish to give their data to a third party. It only indexes the GenDex file that remains on your own website. Each name in the search results is linked directly to the family tree page of your website for this person. GenDexNetwork.org doesn't display your ancestor's detailed data, but brings the visitor directly to your own family tree website. It connects the family trees to make one huge database. Clicking on a name in the search results immediately takes you to the same person on a family tree web page with their genealogical data. You will find the site easy-to-use and very easy to add your gendex. Exciting news! One of genealogy's most well-known and entertaining speakers, Lisa Louise Cooke, will be presenting Google Search Strategies for Common Surnames in a free bonus webinar on Friday, May 24, 2013. 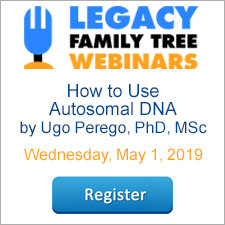 This webinar is a brand new addition to our award-winning 2013 lineup, so visit www.FamilyTreeWebinars.com today to register. 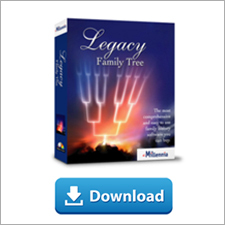 Legacy QuickGuidesTM have quickly become one of the more popular resources for genealogists. Each guide contains four (sometimes five) pages of valuable information covering a variety of genealogy research topics, and are written by genealogists and family historians who are experts in the subject areas. The collection has more than doubled since we last wrote about it - 57 to choose from now. Click on the links below for more information or to purchase. PDFs are $2.95 and printed/laminated copies are $7.95. Click here for instructions on using the PDF guides on your tablet or smartphone. The syllabus for Wednesday's webinar is ready to download (this one's free for everyone!). Just click on the "Download Syllabus" button on the webinar's registration page. FamilySearch has added 2.5 million indexed records and images this week from BillionGraves, Canada, Czech Republic, Italy, Mexico, New Zealand, Spain, and the United States. Notable collection updates include the 815,732 index record and images from the BillionGraves Index collection, and the 753,021 images from the U.S., Washington, County Records, 1856-2009, collection. See the table below for the full list of updates. Search these diverse collections and more than 3.5 billion other records for free at FamilySearch.org.